Heather Hayes gently checks to see if a hummingbird is banded. All of the New Roots camp instructors are volunteers. The annual New Roots outdoor camp includes immigrant students from places like Ethiopia, Thailand, Somalia, Iraq and Mexico. Sixteen-year-old Cathalee La is attending the camp for the fifth time this year. 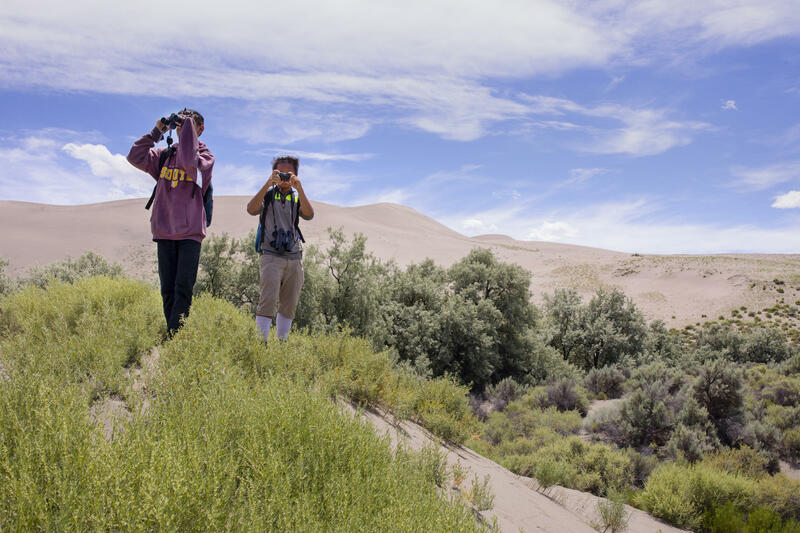 Students explore Bruneau Sand Dunes in Idaho as part of the two-week camp. Students search out native birds during the two-week outdoor camp. On a warm June morning, the 16-year-old is watching attentively as a volunteer weighs a tiny Calliope Hummingbird. 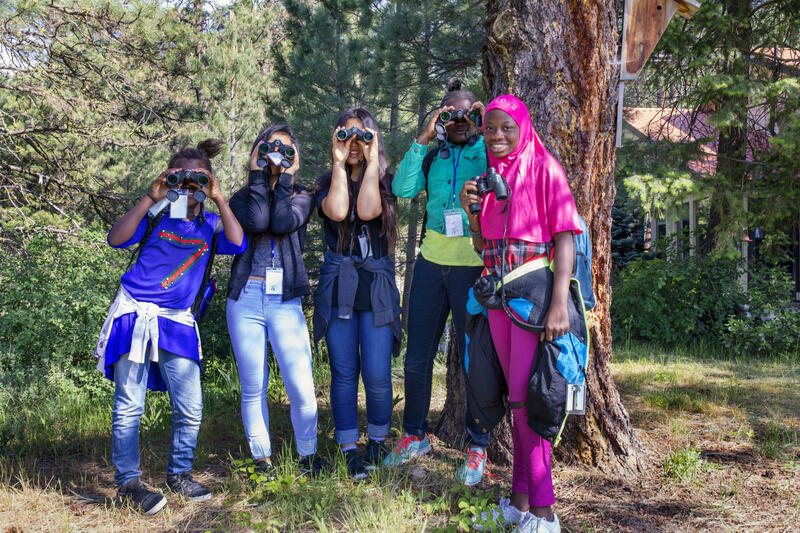 It’s banding day high in the Rocky Mountains, and La is here with other teens who have recently immigrated to the United States to learn about habitat, birds and pollination. “Is this bird a male or female?” asks the volunteer, gingerly holding it between her fingers. The hummingbird is smaller than her thumb, with iridescent green and magenta feathers. “Male!” says La, confidently. She knows that because of the bird’s colorful markings. Students spend the day learning about bird habitat and pollination during one day of the camp. 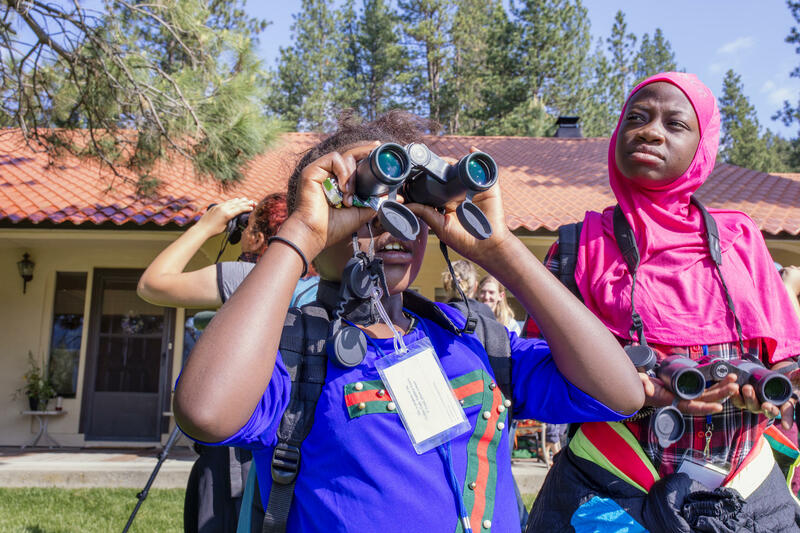 La knows so much about birds because this is her fifth time attending the New Roots summer day camp, a two-week outdoor education program designed by Golden Eagle Audubon Society for refugee and immigrant students in Boise, Idaho. For La, who emigrated from Thailand seven years ago, the camp is her summer highlight. Over the years she’s learned about pollination, the water cycle and how to identify different pine trees and wildlife tracks. Camp founder Liz Urban is a biologist with a background in environmental education, and president of Golden Eagle Audubon Society. A few years ago, she noted that although our region has several robust outdoor programs for kids, few young immigrants were participating. In recent years, Idaho and Utah have frequently had one of the highest per capita refugee settlement rates of any major city in the nation. Urban created the New Roots program five years ago from scratch with initial funding from Audubon, and recruited a team of volunteer educators and chaperones willing to donate their time. 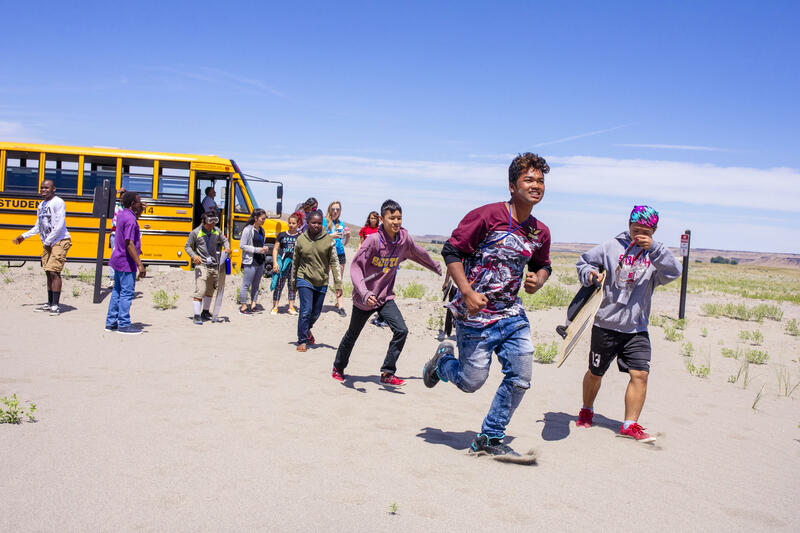 The program is free for students, and includes transportation, lunch, water bottles, backpacks—everything they need to be out in the field every day for two weeks. 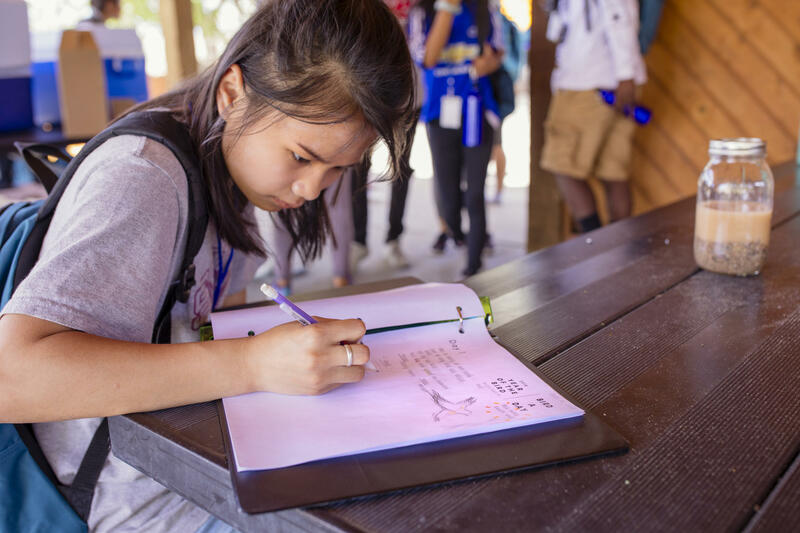 The 30 or so students who attend each summer were born in a diverse array of countries: Afghanistan, Iraq, Iran, Russia, the Democratic Republic of Congo, Mexico, Kenya, Nepal, Thailand and Myanmar. Urban recruits the kids through another local educator, Megan Jones, who works with students who are learning English in Boise schools. Jones invites middle school and high school students who know the language well enough to understand concepts like pollination or evaporation, but their English doesn’t have to be perfect to participate. 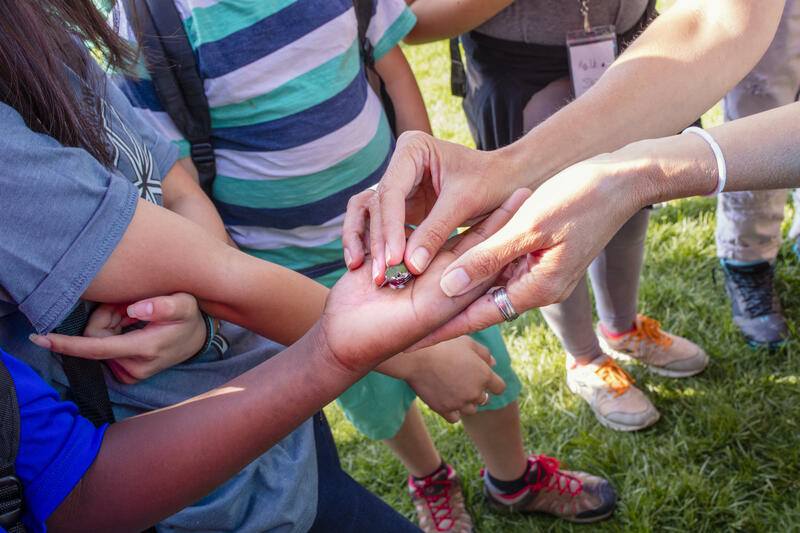 The campers go whitewater rafting, visit an urban garden, study the flora, fauna and geology of the Boise foothills and learn about birds of prey at a conservation area. And for the first time, this year’s curriculum included an overnight camping trip—an adventure that past campers had requested, Urban says. La loves every day of it, but she especially likes learning about plants. Last year, the camp instructors mentioned that botany was a career path. La was amazed. And that’s one of the goals of this camp: exposing students to career options that they might not otherwise have considered. Urban brings in scientists and land managers not just to teach about the natural world, but also to explain what they do for work. The camp has another purpose, too—it exposes students to natural areas that they might not otherwise visit. It is a way of making Idaho feel like home, especially important now that some refugees feel unwelcome or marginalized after changes to national immigration policies. Most of these kids landed in Boise with little context or knowledge of the local environment. More than once Urban has fielded worried questions about whether lions live in the Boise foothills. She’s proud of the ripple effect of New Roots. Past attendees report, for instance, that they took their parents back to parks they explored during camp. The banding site they’re visiting today is up in the mountains, outside a home near the small mining town of Idaho City. As the kids wait amid towering Ponderosa pines for another hummer to visit the trap, they use binoculars to spot Cassin’s Finch and Evening Grosbeaks and other songbirds, and to take in the vista. Naing, from Thailand, is another camp veteran, and when first-timer Guhad asks him how they trap the hummingbirds, Naing explains, using hand gestures to convey how the net falls gently over the bird as it visits the feeder. “Just ‘chhhhh’ and they close it,” he says. “A net, yes, in Africa yeah we did this too,” says Guhad. The camp is also a place for kids to make friends who have had similar life experiences, although their individual stories vary. 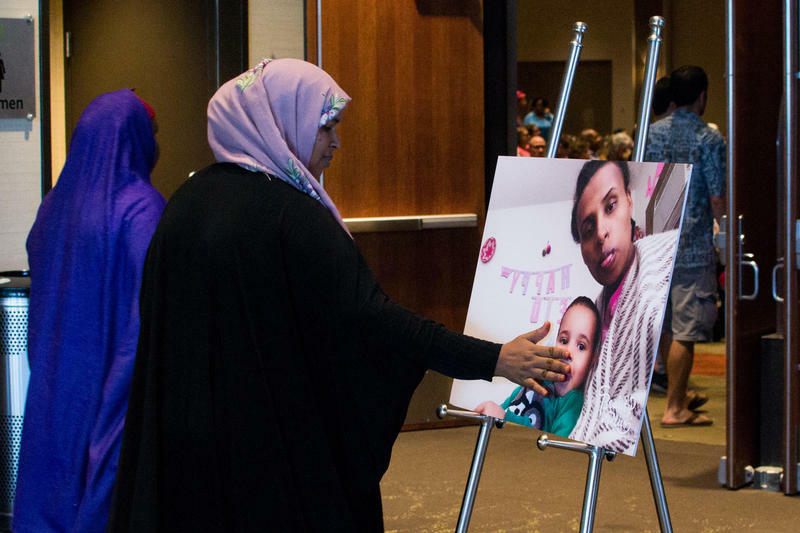 Refugee families come to the United States for various reasons—they may be fleeing civil war, violence or political or religious persecution when they leave their home countries. Cathalee La says she was born in a refugee camp for the Karen people, a minority ethnic group in Thailand, where she lived with her parents and two brothers. Going to school in the camp was hard, she remembers; teachers were strict and if students didn’t study, they could be beaten. La spoke no English when her family arrived in Boise and she started fourth grade. But now as a high schooler, she’s grateful she lives in a city like Boise. At the banding site, the volunteers trap another hummingbird, and La and the other students again crowd around as volunteers make notes about its weight and condition. With her index finger, La touches the bird’s breast gently to feel its heartbeat while the volunteer holds it. “It’s so fast. I just can’t imagine … I wonder how I would feel if my heartbeat was that fast?” she says. 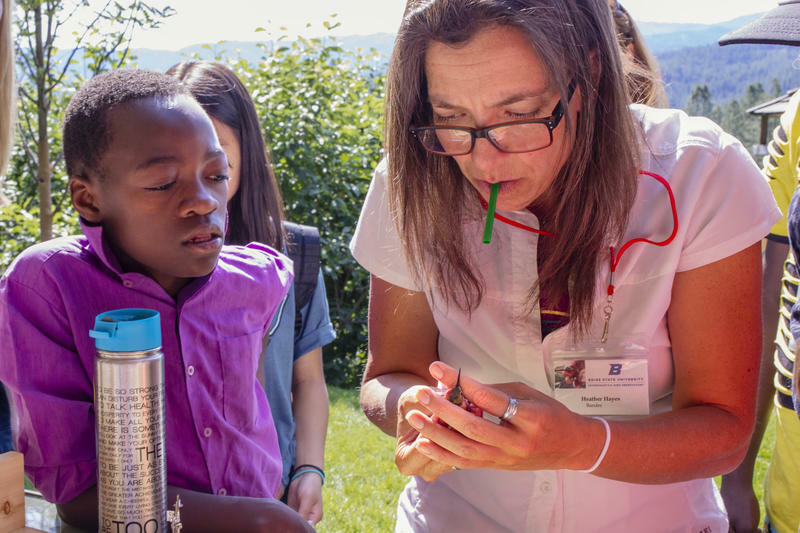 Students gently feel a hummingbird's rapid heart rate. “Do you want to release the bird as a group?” says Urban. The students respond with an enthusiastic yes, and she directs them to make a circle and form a platform with their fingertips. The volunteer sets the tiny bird on their fingers, where it pauses a moment before disappearing into the sky. It’s only day two of this year’s camp, but La is already a bit sad thinking about it being over in a couple of weeks, especially because next year she’ll be a high school graduate, technically too old to attend. This story was created in collaboration between Audubon and the Mountain West News Bureau. Will Reid contibuted reporting.